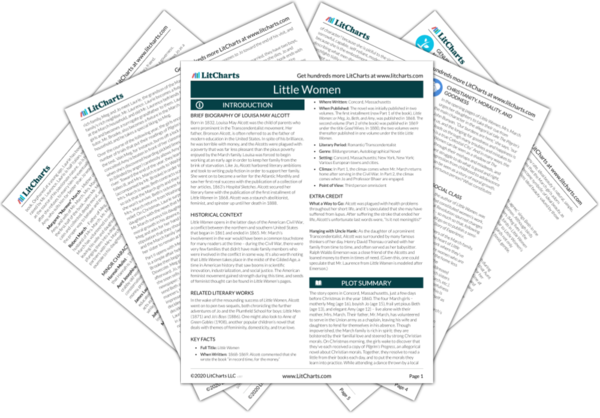 Instant downloads of all 942 LitChart PDFs (including Little Women). 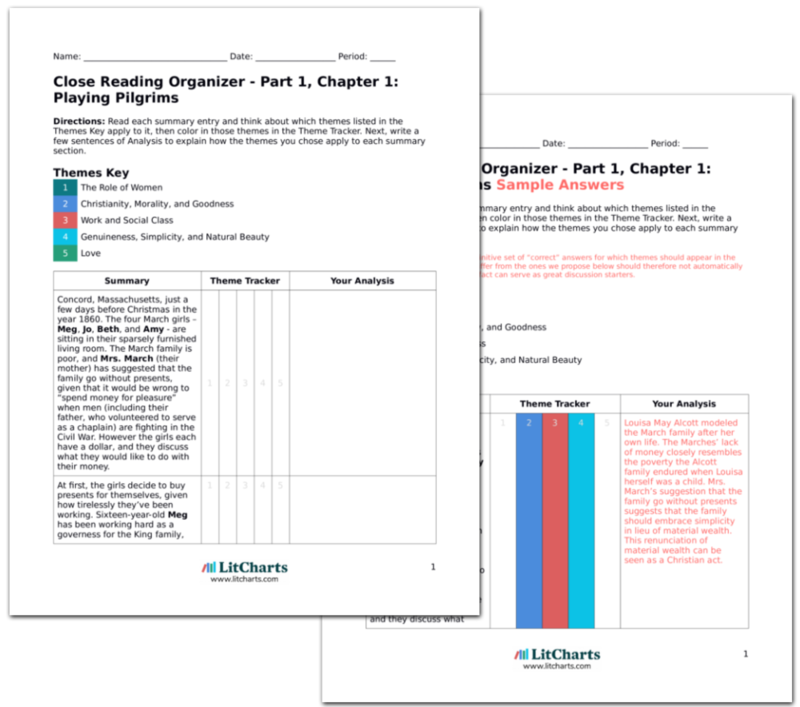 LitCharts assigns a color and icon to each theme in Little Women, which you can use to track the themes throughout the work. It’s a snowy day, and Jo decides to go out and dig paths in the snow. The Marches’ house – a small, brown, shabby dwelling bare of its summer greenery – is separated by a low hedge from Mr. Laurence’s large stone mansion.. She spies Laurie sitting near one of the windows on the second floor. “Poor boy! All alone and sick on this dismal day,” Jo thinks. She throws a snowball at the window, grabbing Laurie’s attention. Laurie admits that he’s been sick with a cold, and he invites Jo to come over. The March family’s poverty is embodied in their house, and is juxtaposed with Mr. Laurence’s comparatively grand and stately mansion (an embodiment of his wealth and stability). The giant house, however, acts as a kind of luxurious prison for the sickly Laurie, who is trapped in a world where he cannot experience familial love. Jo arrives soon after with an armful of offerings for Laurie: a plate of blanc mange (a kind of custard) from Meg and kittens from Beth. Jo straightens up Laurie’s quarters, and offers to read out loud to Laurie. Laurie begs her to talk to him, and Jo tells him about her family. Laurie reveals that he sometimes spies on the March family, but Jo sees that he only does this because he is orphaned (his parents died when he was young, which is why he now lives with his grandfather) and feels lonesome. Jo’s generosity is both Christian and womanly. It turns out that Laurie’s quarters need “a woman’s touch,” given that she feels it necessary to tidy things up a bit. Laurie reveals that he longs for the familial love present in the March household. Laurie steps out momentarily to see his doctor, and while he’s gone Mr. Laurence slips in and surprises Jo. Jo pluckily tells him that she feels Laurie needs to spend more time around kids his own age. Mr. Laurence invites Jo to tea. As he watches Jo and Laurie chatter, Mr. Laurence realizes that there may be some truth to what Jo has told him. The necessity of familial love – and possibly that of motherly or womanly love as well – is emphasized here. Mr. Laurence might be rich, but riches cannot replace the love of a family. Being a good Christian man, Mr. Laurence sees the merit in Jo’s words. Jo reveals that Laurie said he’d been grateful for the “medicine” Mrs. March had sent over, and Meg remarks that Laurie was paying Jo a compliment. Jo is flustered, and chides Meg for being sentimental when all she wants to do is befriend Laurie. Mrs. March gives Jo permission to invite Laurie over to their house, and she reminds Meg “that children should be children as long as they can.” Beth reflects on Pilgrim’s Progress, and how they may reach the Palace Beautiful if they are all very good. Meg is far more savvy to affairs of the heart than Jo is, and is keen on the thought that Laurie might have been flirting with Jo. Jo is still innocent in the realm of romantic love, hence her bashfulness. Mrs. March’s comment on childhood is very much of her time; the modern notion of childhood was essentially invented in the nineteenth century. Beth continues to be the voice of virtue among the March girls. 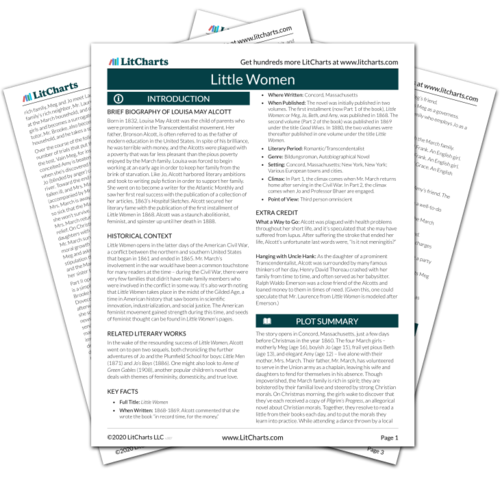 Get the entire Little Women LitChart as a printable PDF. Reges, Margaret. "Little Women Part 1, Chapter 5: Being Neighborly." LitCharts. LitCharts LLC, 24 Nov 2014. Web. 21 Apr 2019. Reges, Margaret. "Little Women Part 1, Chapter 5: Being Neighborly." LitCharts LLC, November 24, 2014. Retrieved April 21, 2019. https://www.litcharts.com/lit/little-women/part-1-chapter-5-being-neighborly.